Sometimes its nice to just kick back and let things happen and not make a fuss – but this week that just isn’t you! Don’t be afraid to openly disagree with those closest to you and to make your own needs and intentions clear. The key is to do this in a relaxed, matter of fact manner and don’t let the “little me” get in the way. In other words, assertiveness isn’t just about saying “no” for the sake of it or taking things personally and getting all bent out of shape. It’s about clearly stating what you really want. You may feel tempted to just go along with what someone else wants in order to keep the peace, but you won’t feel all that peaceful on the inside if you do that! So let your inner fairy of assertiveness out to play this week! 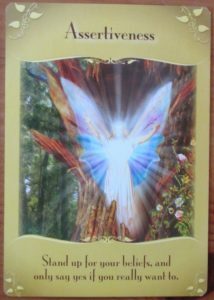 This entry was posted in October 2013 and tagged fairy oracle cards, magical messages from the fairies, oracle card reading. Bookmark the permalink. Oh my goodness! I only just read today, Saturday morning, AFTER yesterday’s good fortune. Or should I say, because I asserted myself. I have needed a particular letter of recommendation from a higher-up who refused to do so, despite me asking for 4 years! Finally, I asserted myself twice this week, and lo and behold, she acquiesced! Oh joy! Now I can FINALLY move on with my life and career. Thank you so much Kate for such a wonderful website/blog. You REALLY do serve with light and love! Namaste! Thank you Maria for your nice comments 🙂 That is so wonderful you were able to be assertive and get the results you wanted – high five! Right this very minute, I’m working on the text for The Chariot for the PT. Thinking a lot about assertiveness! And, also, I’ve got an event in a couple of weeks that I’m dreading. I’m trying to figure out what’s the way to negotiate so that I’m taking care of myself while, at the same time, honoring my commitment. Your take on the Assertiveness card adds nicely to my considerations. That is so good to hear – I love hearing how my reading makes sense in your particular situation 🙂 Thanks for sharing, Jamie and I hope (i mean I know) that it will all work out perfectly for you. Well, today on a walk, I heard my guides tell me that I absolutely should not attend the event. I went home, found someone to take my place as a substitute presenter, and begged off, offering my friend in my place.